Automate staining and coverslipping to make some time, increase production, improve quality control, save money and improve the environment in your lab! Easy to programming and change between programs. Protocols for up to 10 staining programs can be stored. The ultimate coverslipper designed for carefree, user friendly, automated glass coverslipping. 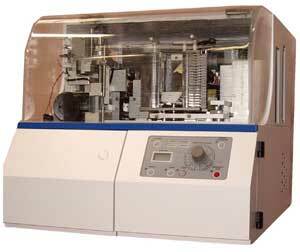 25 years of automated glass coverslipping experience have led to the development of the HCM6000. The exclusive mountant media dispensing system eliminates the formation of air bubbles under the coverglass. All new microwaveable slide baskets interface with most automated staining machines. Available with semi-disposable, ready to load, pre-filled coverglass and mountant dispensers. Compact footprint requires minimal counterspace. Compact footprint—Only 34” (86cm) wide. Continuous load with multiple protocols. Patented, programmable rinse water flow control. State of the art, user-friendly operator interface with touch screen. Built in fume extraction with ability to connect to lab fume exhaust system. Selectable slide agitation for up to 4 dips upon rack entry into station. Easily accessible status display of all active racks. Password protection for Utility and Service modes. For Histology and Cytology. Unsurpassed performance, efficiency and throughput. Typical throughput 1 to 1,200 slides per hour. Slide baskets with 1 to 20 slides can be loaded at any time. May reduce reagent consumption up to 40%. Straight forward, easy to use operation. No programming skills required. Made in U.S.A.
Fast - Easy - Portable - Economical. The H/I AutoSlipper® This revolutionary, patented device automatically dispenses glass coverslips one at a time, eliminating finger prints on the coverslip and the sticking together of coverslips. Battery operated, the AutoSlipper® uses disposable cartridges of pre-cleaned, stick free MicroSlip™ cover glass. Weighs under 14 oz. fully loaded. Ideal for routine coverslipping, frozen sections and special stains. HistoPro 414 Linear Stainer offers consistent staining of slides in and easy to use, compact, cost conscious package. It is ideal for Mohs techniques, special stains, and general surgical pathology frozen sections. H/I has coverglass options that will faciliate and expedite glass coverslipping. From non-stick SuperSlip™ in pre-loaded coverglass cartridges for the HCM6000 and H/I AutoSlipper™, we have a coverglass solution for you. Do you need all the benefits of automation but can't seem to fit it in your budget? Request information about special offers on demo units and factory refurbished RCM3655's.